Examining ships that have made an impact on Naval Warfare and Naval History. Hello out there! The purpose of this blog is to spread the word that Naval History is interesting and worth knowing. After searching the net, I couldn't find a single place that dealt solely with the subject of Naval Warfare, so I decided to create one. I will be posting pictures and text of various ships and will then describe what part those ships played in Naval Warfare and Naval History. For anyone interested in these subjects, I hope this will be your new home. Every Tuesday a new ship will be posted and each month I'll have a "Ship of the Month" displayed at the bottom of the blog. Both famous and not-so-famous ships will be highlighted. But what they all have in common is that, in some small way, they made an impact on Naval Warfare and Naval History. I think it's a historical lesson worth reading. I also hope you like what you see and I look forward to hearing from you. Thanks for dropping by. Get the New Suspense Thriller! Click on the book cover for more information! This blog was created by Remo. I have been forced to close my "Comments" section due to the enormous amount of spam that is being sent to it. I just can't keep up with it anymore, so I decided to end the comments. People who flood blogs with spam are jerks and should be ashamed of themselves. Anyway, if you want to contact me, e-mail me at Libertyship46@aol.com. On balance, I get less spam via my e-mail account than in the "Comments" section of the blog. So if you want to make a comment, send me an e-mail. Other readers on the blog will not be able to see it, but at least I'll have some contact with the outside world! Thank you. 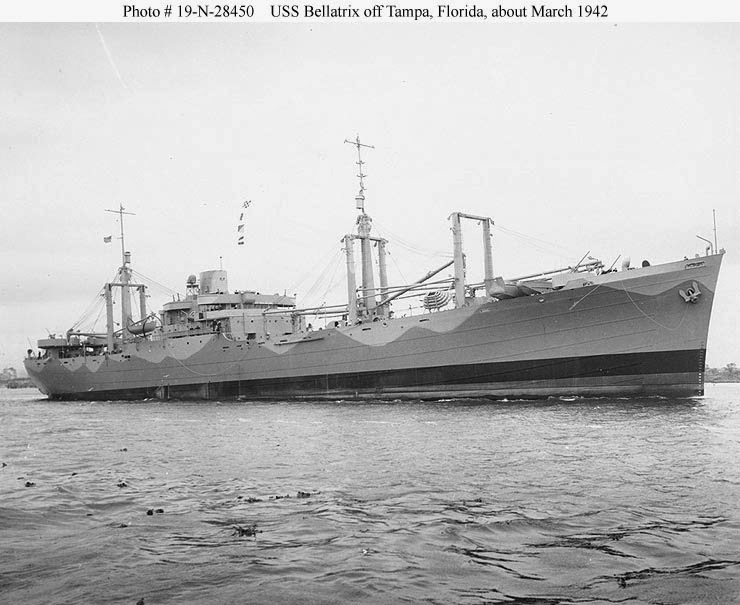 Figure 1: USS Bellatrix (AK-20) off Tampa, Florida, circa March 1942. Photograph from the Bureau of Ships Collection in the US National Archives. Click on photograph for larger image. Figure 2: USS Bellatrix (AKA-3) anchored off San Diego, California, 19 February 1943. A US Navy Bureau of Ships photograph now in the collections of the US National Archives. Click on photograph for larger image. Figure 3: USS Bellatrix (AKA-3) underway, date and location unknown. Photograph courtesy of Bill Gurrola. Click on photograph for larger image. Figure 4: USS Bellatrix (AKA-3) underway, circa the mid-1950s. Exact date and place unknown. Official US Navy Photograph, from the collections of the Naval Historical Center. Click on photograph for larger image. 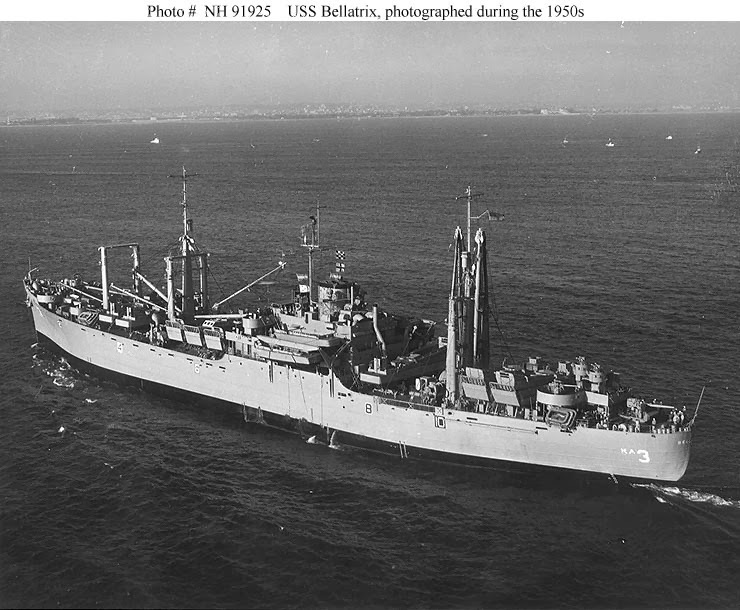 Figure 5: USS Bellatrix (AKA-3) photographed circa the mid-1950s. Exact date and place unknown. Official US Navy Photograph, from the collections of the Naval Historical Center. Click on photograph for larger image. Figure 6: Ex-USS Bellatrix (AKA-3) in Peruvian naval service as Independencia (D-130), moored at a pier at Hamburg, Germany, in October 1977. Photograph courtesy of Gerhard Mueller-Debus. Click on photograph for larger image. Originally laid down as the freighter SS Raven, the ship was acquired by the US Navy for use as a cargo vessel on 16 April 1941 and re-named USS Bellatrix (AK-20), after the Latin word for “female warrior.” The 8,045-ton Bellatrix was built by the Tampa Shipbuilding Company at Tampa, Florida, and was commissioned on 17 February 1942. The ship was approximately 459 feet long and 63 feet wide, had a top speed of 16.5 knots, and had a crew of 267 officers and men. Bellatrix was heavily armed for a cargo ship with one 5-inch gun, eight 40-mm guns, and 18 20-mm guns. 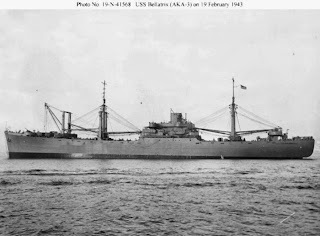 Bellatrix served in the Pacific for the bulk of 1942, participating in the invasion of Guadalcanal in the Solomon Islands. Starting in August 1942, Bellatrix supported the desperate struggle to hold Guadalcanal by bringing badly needed supplies to the American troops on the island. Numerous attacks were made by Japanese aircraft on Bellatrix as she steamed off the coast of Guadalcanal. On 8 August, a wave of Japanese bombers came in at low level towards the American transports and cargo ships off Lunga Point, Guadalcanal. Two of the bombers headed straight for Bellatrix, but her crew opened fire with every gun on board the ship. One of the aircraft passed close astern, visibly damaged from several 20-mm shell holes, while the second plane passed overhead. Under intense gunfire from several ships in the American task group, the second bomber was shot down. But then the Bellatrix’s crew saw the other bomber crash into the nearby transport USS George F. Elliott (AP-13), which started an enormous gasoline fire that eventually caused the ship to be abandoned. The critically damaged George F. Elliott couldn’t be saved and eventually had to be sunk by the destroyer USS Hull (DD-350). During the next five months, Bellatrix supported American forces on Guadalcanal and Tulagi, also in the Solomon Islands. While unloading cargo off Guadalcanal in the early evening of 8 September 1942, two Japanese fighters attacked Bellatrix. Fortunately, heavy anti-aircraft fire from the cargo ship forced the airplanes off their course, so that the bombs they dropped landed harmlessly between Bellatrix and the nearby transport USS Fuller (AP-14). The next morning, another air raid, this time attempted by 18 Japanese bombers, dropped a large number of bombs which landed just ahead of Bellatrix, with shrapnel from the exploding bombs wounding two crewmen. Bellatrix’s gunners claimed to have shot down one of the bombers. The ship’s luck was holding, because none of the bombs actually hit Bellatrix. On 14 September 1942, during heavy fighting on Guadalcanal, Bellatrix transported 247 US Marines from Tulagi to Guadalcanal. A major Japanese advance on Guadalcanal was beaten back by the Marines, primarily because of the reinforcements brought in by Bellatrix. The next day, five Japanese dive bombers attacked the American cargo ships off Guadalcanal. Once again, all of the guns on board Bellatrix opened fire and disrupted the attack. But two of the bombs dropped by the planes exploded next to the starboard side of Bellatrix, buckling her hull plating, tripping electrical circuit breakers throughout the ship, and blowing out dozens of bolts and rivets. But Bellatrix remained afloat and continued delivering her badly needed supplies to the Marines on Guadalcanal. After spending several more months transporting fuel and supplies to Guadalcanal, Bellatrix was sent back to the United States for an overhaul. 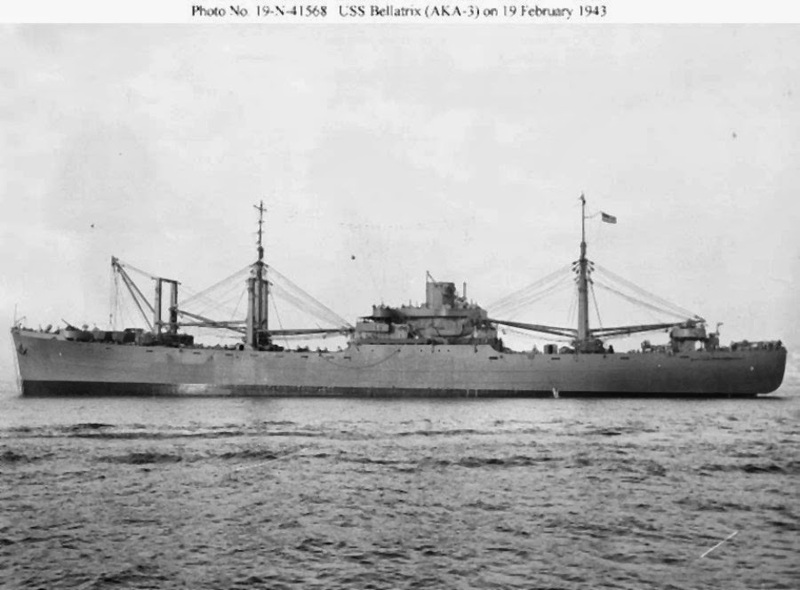 On 1 February 1943, Bellatrix was re-classified an attack cargo ship and re-designated AKA-3. The attack cargo ship arrived at San Diego, California, on 4 February. After a brief overhaul, Bellatrix left San Diego and headed south for the Panama Canal. Once the ship transited the canal, she steamed north to Charleston, South Carolina, arriving there on 8 March. On 8 June, Bellatrix was assigned to a huge convoy that took her to Mers-el-Kebir, Algeria, arriving there on 22 June. Those ships in Algeria then participated in the Allied invasion of Sicily in July. After unloading her supplies and surviving more air attacks off the coast of Sicily, only this time by German bombers, Bellatrix headed back to the United States. Bellatrix returned to the south Pacific later that year, but a supply run from New Zealand to the Gilbert Islands was terminated prematurely by engine trouble in November, and Bellatrix had to go to San Francisco, California, for repairs. After repairs to her engines were completed, Bellatrix returned to service in March 1944. In June, the ship participated in the invasion of Saipan in the Mariana Islands. For the remainder of the war in the Pacific, Bellatirx was used as an amphibious assault training ship off the coast of southern California. The ship also carried cargo to various ports in California from late 1945 to early 1946. Bellatrix was decommissioned on 1 April 1946 and her name was struck from the Naval Vessel Register on 1 May. She then was transferred to the Maritime Commission, which laid her up in the National Defense Reserve Fleet at Suisun Bay, California, on 30 June 1946. But the outbreak of the Korean War in June 1950 suddenly increased the US Navy’s need for cargo ships. Following some minor repairs and equipment modifications at the Mare Island Navy Yard at Mare Island, California, Bellatrix was re-commissioned on 15 March 1952. 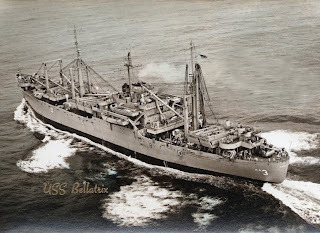 Bellatrix performed logistics duties in the Pacific until December 1952 and then conducted cargo operations and training exercises along the coast of California until early 1955. Bellatrix was decommissioned once again on 3 June 1955. She eventually was assigned to the Bremerton Group of the Pacific Reserve Fleet and remained there until 6 June 1960, when her name was struck from the Naval Vessel Register and she was transferred to the Maritime Administration. 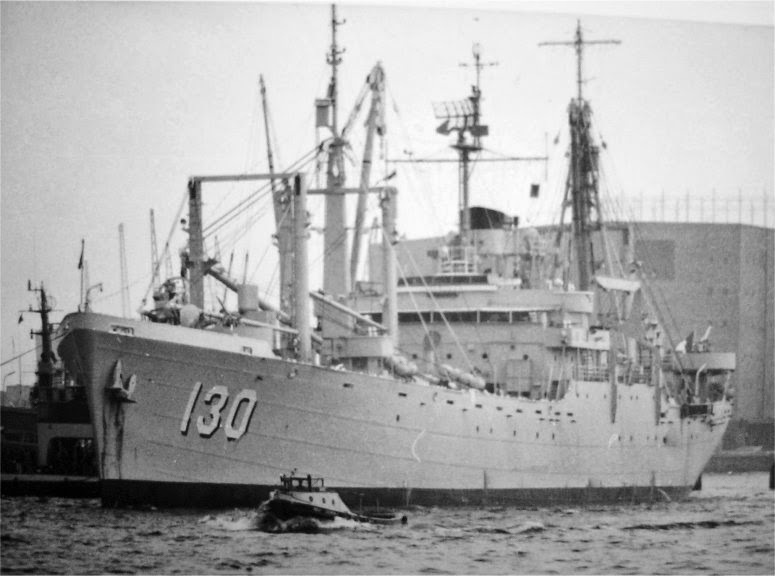 Bellatrix was reinstated on the Naval Vessel Register on 15 March 1963, but then was leased to the Peruvian Navy as Independencia under the auspices of the Military Assistance Program. Her name was struck from the Naval Vessel Register for the third and last time on 14 November 1963. The ship was sold outright to Peru on 20 March 1964 and she served in the Peruvian Navy as a cadet training and cargo ship until scrapped in October 1991. 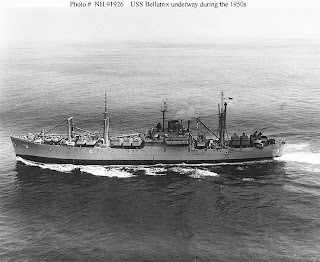 USS Bellatrix received five battle stars for her service in World War II and one battle star for her service during the Korean War. The 795-ton USS Wandank (AT-26) was an Algorma class fleet tug that was built by the Ferguson Steel and Iron Company at Buffalo, New York, and was commissioned on 23 March 1920. The ship was approximately 156 feet long and 30 feet wide, had a top speed of 13 knots, and had a crew of 25 officers and men. 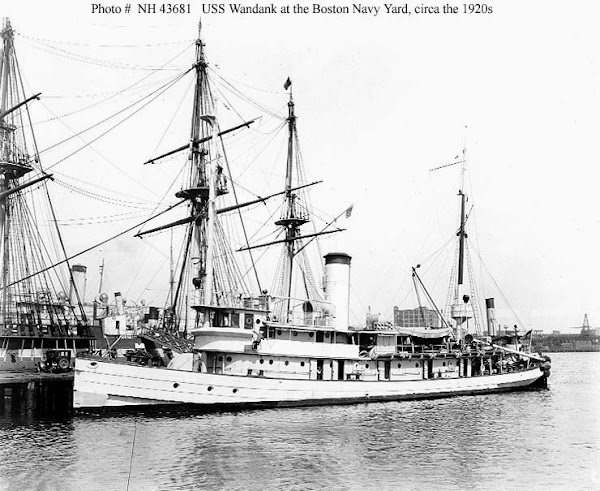 For roughly 20 years after being commissioned, Wandank worked along America’s east coast, primarily near her base at Norfolk, Virginia. In 1939, she assisted with the rescue and salvage efforts for the submarine USS Squalus (SS-192), which had accidently sunk off Portsmouth, New Hampshire. Wandank then was based at Boston, Massachusetts, in October 1940 and remained there throughout World War II. Her designation was changed to ATO-26 in May of 1944. Wandank was decommissioned in September 1946 and in July 1947 was sold to a commercial firm in New Orleans, Louisiana, which operated her under the name of W.A. Bisso. The tug was scrapped in 1971 after being in service for 51 years. The photograph shows USS Wandank at Boston circa the later 1920s or early 1930s. USS Constitution is on the opposite side of the pier. US Naval Historical Center Photograph.